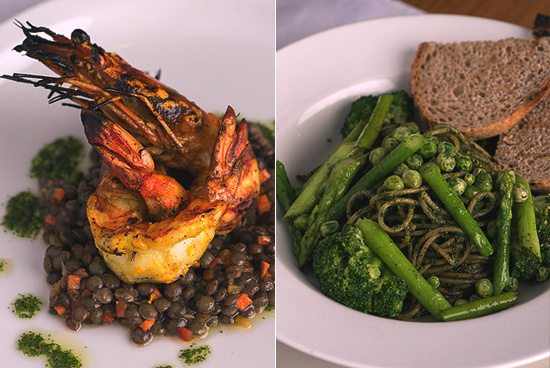 Chef Marivic Diaz Lim shows you veggies can be just as flavorful as meat. 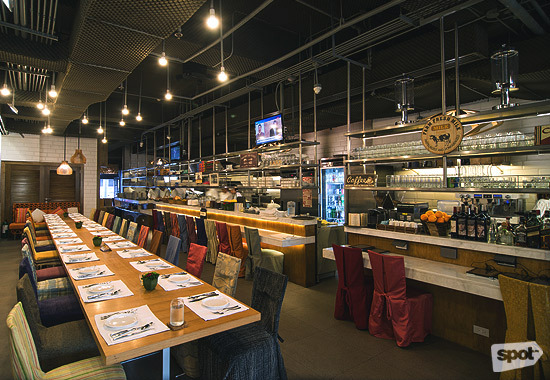 It looks like a kitchen-turned-restaurant. “You know how a lot of people are turned off when you say vegetarian—the challenge there is to make the dishes—doesn’t mean that because it’s vegetarian or healthy, doesn’t mean it doesn’t taste good. It’s hard. We need to educate people to do that,” Chef Marivic says. 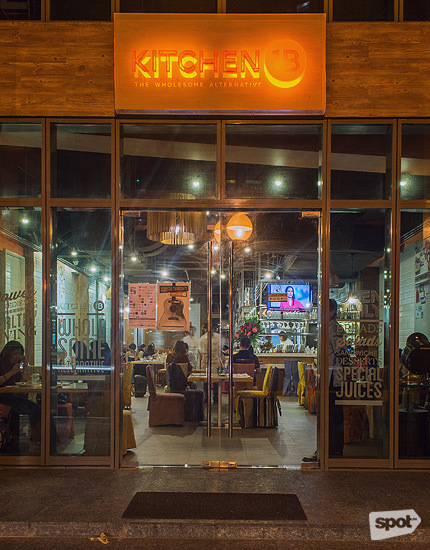 Kitchen 1B still offers dishes—all of them healthy—that regulars cannot live without (sometimes almost literally, judging by the complaints the chef gets when she attempts to take a beloved item off the menu). 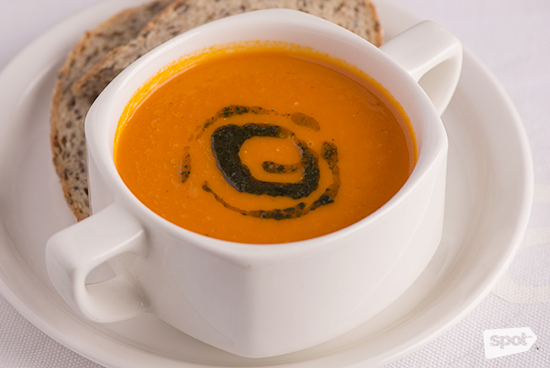 Like the Shot of Heirloom Tomato Soup (P230), for example. Topped with almond herb pesto drizzle, the soup is thick, tangy, and comforting. 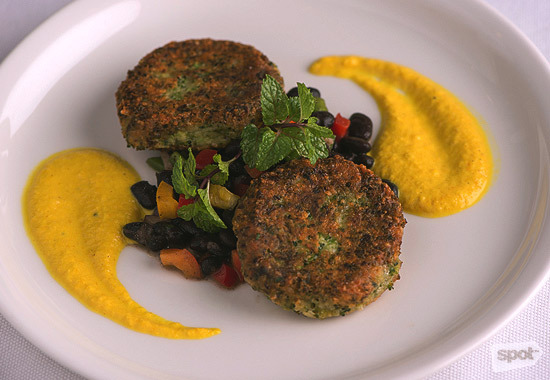 “During my travels, when I tried heirloom tomatoes, it’s just different and I really liked it. When I found out that they grow heirloom tomatoes in Bukidnon and I know the guy that farms it, I was just so happy to serve it. It’s just very different,” she says. 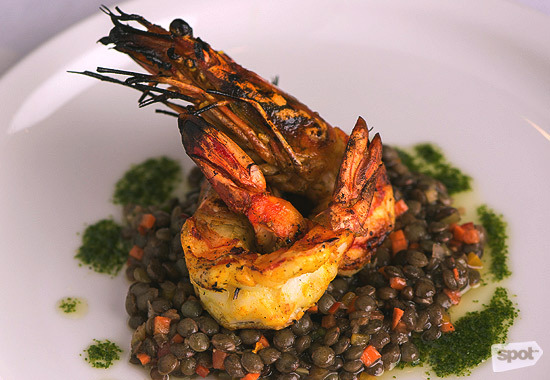 The Grilled Prawns & Lentil Salad (P510), finished with balsamic vinaigrette and cilantro oil, is light yet filling, the lentils complementing the smoky grilled prawn. “I learned to cook this dish when I was working in New York. And because I know lentils are good for us, I said, ‘Why don’t I do that dish I used to do in New York?’” Chef Marivic shares. “I wanted a vegetable croquette,” she explains. “We put feta cheese. 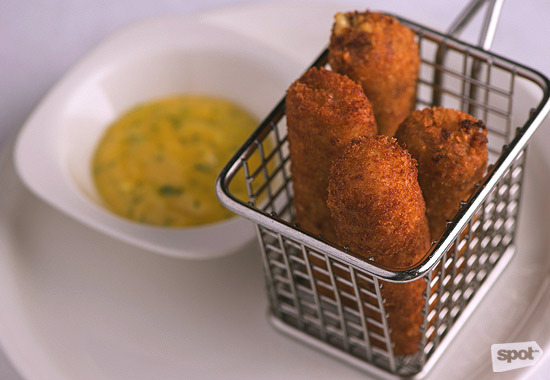 The cheese that we get is from Malagos, Davao, and of course, croquettes go well with aioli, so I (paired it with) turmeric aioli.” The Eggplant Croquettes (P450), stuffed with feta cheese and served with tarragon-turmeric aioli, are neither oily nor dense. People who have a problem with eggplant will be glad to know that these babies don’t taste like the veg at all. 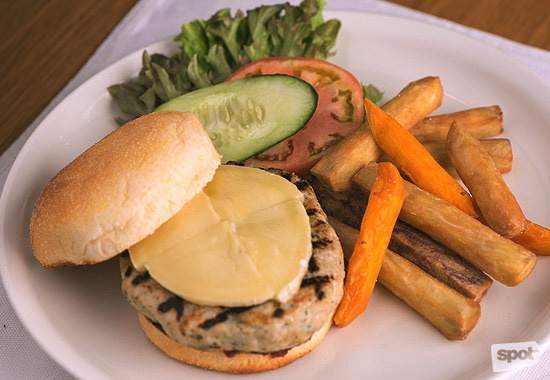 The Turkey Burger (P740), served with brie and cranberry compote in between a cornbread bun, plus a side of sweet potato fries, is a nice, light alternative to the regular beef burger. She narrates that back when Apartment 1B in Salcedo was just a village restaurant, she would heed requests. “One lady told me, ‘You know, I miss my turkey burger in San Francisco,’ and I said, ‘I’ll make you a turkey burger.’” She put it on the specials menu and the dish never left. The treatment is different at Kitchen 1B: with brie, cranberry, and sweet potato fries. Both the patty and bread are homemade. 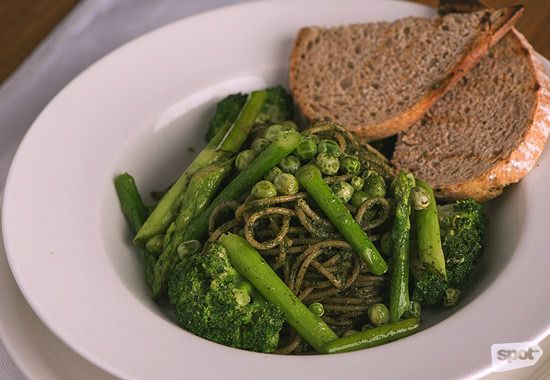 The Whole Wheat Spaghetti & Vegetables (P560)—pasta with herb (parsley, tarragon, mint) almond pesto served with broccoli, asparagus, and green peas, should delight the vegetarian pasta lover. “I call it pesto but I wanted it different, because I’ve tried something like this in my travels as well. We use parsley, tarragon, and mint, and instead of pine nuts, we use almonds,” she explains. 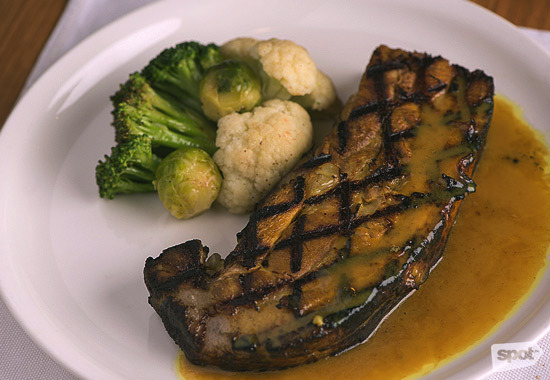 The Grilled Coco-Ginger Pork Rib (P780)—probiotic hormone-free pork, yellow ginger, turmeric, lemongrass, cruciferous vegetables—is an original recipe from Tribeca, Chef Marivic’s first restaurant, which she opened in 1996. “I remembered it and I wanted to revive it. The difference is the sauce. There it was just ginger and coconut, but I added the turmeric [this time],” she says. Some of the dishes have a siding of cruciferous vegetables. Broccoli, cauliflower, brussels sprouts are good anti-cancer vegetables. 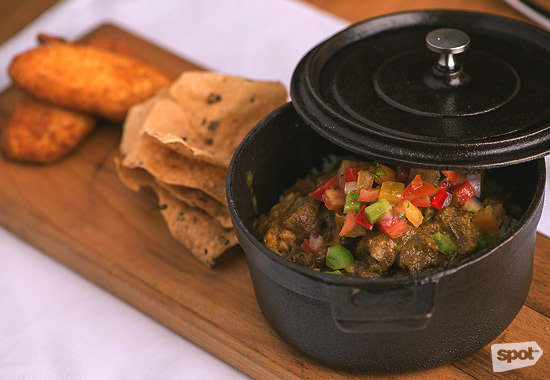 The Lamb Curry (P950), Australian lamb, basmati rice, tomato salsa, fried sweet plantain, papadam, is delicious, the beautifully spiced lamb curry resting on fluffy rice worth the hefty price tag. Lamb curry is an Apartment 1B specialty, but since she uses pasture-fed, healthy lambs, it was fitting to integrate it into Kitchen 1B as well. Coming this November are new dishes that customers will probably add to their list of favorites, all of them tasty, all of them meat-free. 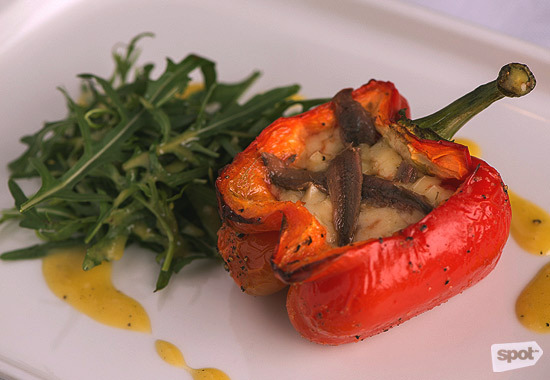 There is the Baked Stuffed Capsicum (P530) stuffed with heirloom cherry tomatoes, bocconcini, basil, and anchovies, with the bell peppers cute edible packages for a delicious medley of flavor. 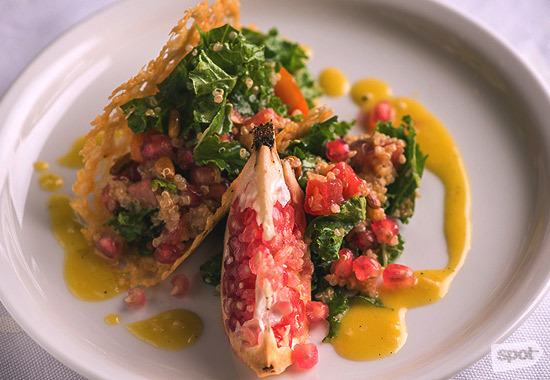 The Kale and Quinoa Salad (P380) tossed with pomegranate, heirloom cherry tomatoes, watermelon, honey-mustard lemon vinaigrette and served in a crispy parmesan taco-shaped shell, is fun to eat. The fruits offer different layers of sweetness, while the cheese makes the dish feel decadent, but in a fun way. 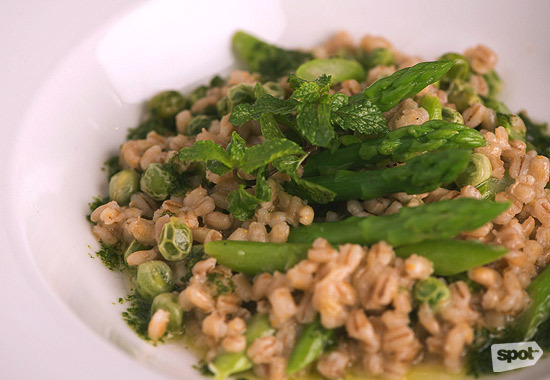 The Spring Barley Risotto (P350), flavored with parmesan, white wine, green peas, and asparagus, is a comforting dish. Chef Marivic is enthusiastic about the current trend for organic ingredients. “I think it’s a good thing because the organic farmers are supported. 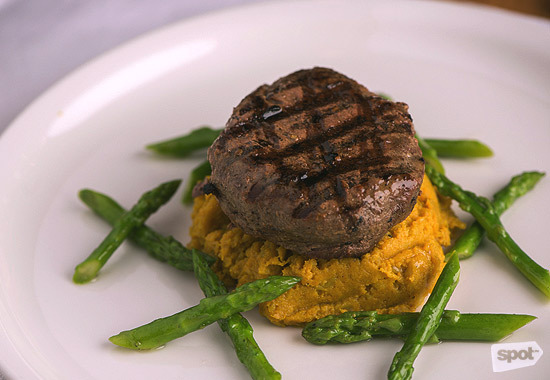 If there are more restaurants like us that serve organic vegetables, meats and all, you support the farmers, then the industry can grow, and if it grows, the prices will go down. It’s a good thing,” she says. 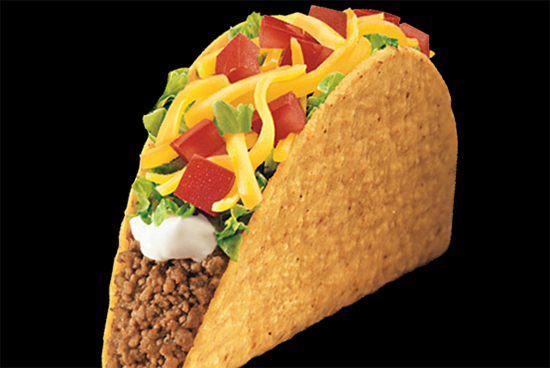 Right now, the plan is to develop more dishes. “This is a new restaurant, so I think I’m more flexible in adding and changing things to and in the menu,” Chef Marivic details. “I’m not claiming to be a vegetarian restaurant or a vegan restaurant—there are way better restaurants out there that specialize in it really,” she says. "My only goal is hormone-free, pesticide-free. I still have my burgers, I still have my pork rib, I still have my steak, I still fry stuff. 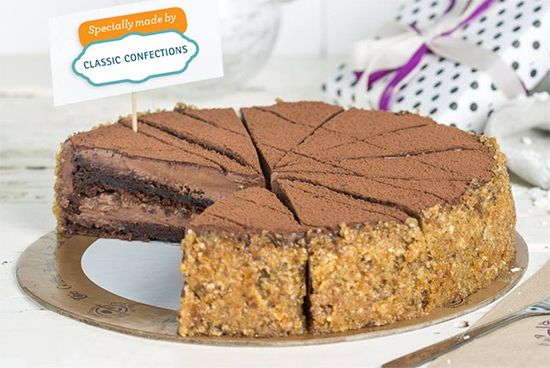 It’s organic, clean, and trying to use as much superfoods that I can in my ingredients."